I now return to the series of posts in which I’ve been exploring the possibility that after betraying Jesus, Judas Iscariot may have sincerely repented and been saved. I considered the gospel narratives in my first post, and then turned to look at all the places where Jesus and the apostles say Scripture was fulfilled in the case of Judas, to see whether this means he was destined to play the role of betrayer and be lost. In my second post I argued that Scripture being “fulfilled” actually means not that a foreseen future event has come to pass, but that an earlier statement has taken on a fuller and deeper meaning in light of later redemptive-historical developments. And so in the following post, I explained that the phrase in Psalm 41, “He who shared my bread has turned against me,” cited as an example of fulfillment in all four gospels, illuminates the identity and experience of Jesus as the “greater David,” but it does not specifically identify Judas as his betrayer in advance. As I explained in that earlier post, these two Scripture citations, which come from what we now know as Psalm 69 and Psalm 109, respectively, are not predictions about the future Messiah, but rather “imprecations,” or calls for judgment on present-day enemies, in two of David’s “psalms of supplication.” Nevertheless, they provide an inspired precedent that help the fledgling community of Jesus’ followers solve what would otherwise be a vexing problem. They want to honor Jesus’ intention to have twelve apostles, corresponding to the twelve tribes of Israel, who can serve as witnesses of his life and especially his resurrection. But Judas is now gone. Still, Jesus chose him as an apostle; on what authority can the community choose someone else to replace him? Peter recognizes that if they do, they will be fulfilling Scripture, and this provides the divine imprimatur they need to bring the number of apostles back up to twelve. In other words, the specific fulfillment here is not that Judas betrayed Jesus and was lost, but that he was replaced. For Judas to lose such a vital place (for it to become “deserted,” as Psalm 69 puts it) was a momentous occurrence in the life of the covenant community, one that Peter sees foreshadowed in an earlier experience of David. Still, this all has to do with Judas’s office–not with his eternal disposition. Indeed, Peter pointedly does not quote another part of the imprecation in Psalm 69, where David says of his enemies, “Do not let them share in your salvation. May they be blotted out of the book of life!” He apparently does not have this in view as something that applies to Judas, any more than some other phrases in these psalms, such as “when he is tried, let him be found guilty” (Judas was never put on trial for what he did) or “may a creditor seize all he has” (this never happened to Judas, either). As we saw earlier in the case of Psalm 41, where David was sick because he had sinned, not every detail from these psalms carries over from David’s life into Jesus’ experience. So we should conclude that the “fulfillment” of Scripture cited by Peter at the beginning of Acts is that Judas forfeited his apostolic office when he betrayed Jesus, and we can consider this a definitive judgment–even if Judas had lived and repented sincerely, he would not have been restored as an apostle. But we do not have here a prediction in earlier Scripture that Judas also definitively forfeited his soul when he betrayed Jesus, as if there were some sins that were beyond the power or willingness of God to forgive. 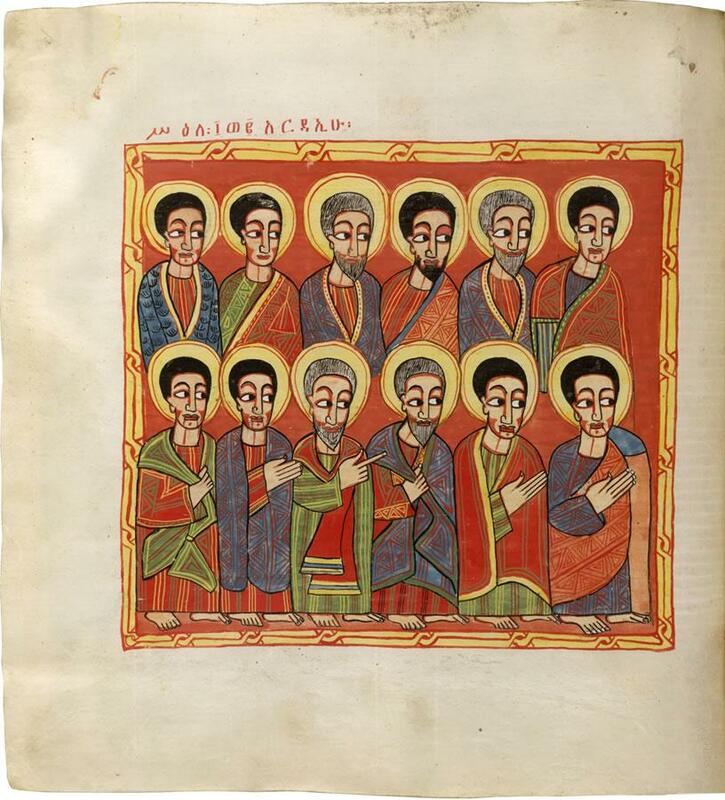 The Twelve Apostles, from an Ethiopian Bible manuscript. It was important to have twelve to echo the number of the tribes of Israel. Jesus chose all of the apostles to begin with. When one of them, Judas, forfeited his position, on what authority could the church choose a replacement? Previous Previous post: Does God plan every move of our lives if we ask Him to?